Gustav Nyquist was one of the top-six wingers that the Bruins were linked to this Trade Deadline. However, it has been reported that he has been traded to the San Jose Sharks for a second-round pick, as well as a third-round selection. It is important to note that the third-round pick will turn into a second if the Sharks make it to the Stanley Cup Finals, or if he decides to re-sign there. However, even if that occurs, it is clear that this was not a large package for a very solid scorer. The Bruins were reportedly close to making a deal happen with the Red Wings, but they ultimately decided to avoid trading within the division. This makes sense, as it could have been possible that Nyquist would have liked to stay in Boston after the trade. However, his services would have been greatly appreciated in Beantown. He would have been the perfect second-line winger, especially when seeing as how the Bruins likely would have been able to keep their first-rounder in a move. BOS believed to be the Eastern Conference team that was closest to landing Nyquist. When looking at Nyquist’s statistics, it is clear that he is a very effective forward at the NHL level. This season has been a particularly solid one for the veteran, as he has put up 16 goals and 49 points in 62 games. Keep in mind, he has been playing with an offensively weak Red Wings club. It is fair to assume that he would have slotted perfectly on the second line with David Krejci and Jake DeBrusk. Yet, he will likely have a lot of fun in San Jose though with their stacked offensive core. The list of players available is definitely decreasing, and this will continue to occur as the day progresses. In terms of an overall fit, Nyquist very well could have the been the perfect one. If Wayne Simmonds was the same player he was three years ago, he would be a great addition, but his offensive numbers are decreasing rapidly. The idea of acquiring Mark Stone is a very appealing one, but at the same time, it would end up costing the Bruins an immense amount. Nyquist, on the other hand, clearly would have been a solid gamble, even if his offensive numbers are a bit lower than Stone’s. 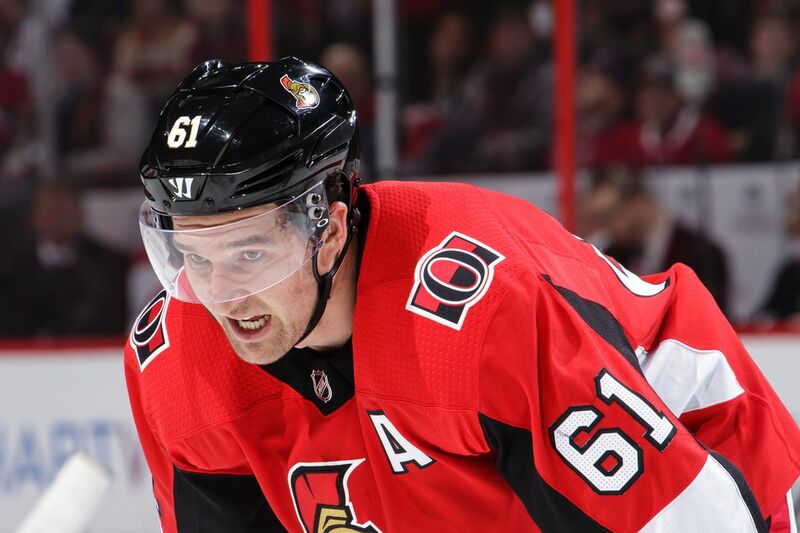 Asking around, I get the sense that the price on Mark Stone for the Bruins is way, way too high, even for an "all in" move. Could be the start of a deadline day prayer that somebody throws the moon at them, but something to consider before your inevitable 4:30 p.m. sadness nap. After the Bruins went on their seven-game winning streak, it became even clearer that they need to be buyers. There is definitely potential for them to have a deep playoff run, but if they are to succeed, it is absolutely essential that they bring in a top-six forward. They simply need to improve upon the lineup that they currently have. The addition of Charlie Coyle gave them the solid third-line center they were searching for, but more is needed. The Atlantic Division has become the best one in the NHL, so the Bruins need to keep up. Losing out on Gustav Nyquist is not something that is going to sink the Bruins’ season. However, he definitely would have been a solid addition if a deal came into fruition. One cannot blame the Red Wings for deciding to go against trading with the Bruins, but man, bringing in a player of Nyquist’s caliber for that price would have been perfect. Alas, we will have to see what the Bruins end up doing in the upcoming hours. A persistent storyline for quite some time surrounding the Boston Bruins has been their need for scoring. When discussing the topic, the second-line right wing and third-line center positions are of emphasis. Personally, I feel that the second-line right wing should be the bigger priority, and there are certainly good potential fits out there on the trade market. Acquiring Mark Stone would be quite the haul. He brings a great three-zone game to the table and could fit in seamlessly with David Krejci in the middle and either someone like Jake DeBrusk or Peter Cehlarik on the left. Stone leads the Senators in points and is tied in goals with Matt Duchene (25-31-56). Currently making $7.35 million for this season, Stone is rightfully set for a raise in unrestricted free agency this summer. Despite having buyer’s remorse from the Rick Nash rental trade last season, Stone is a very plausible rental option due to the potential for significant positive impact in all three zones. On TSN’s latest trade bait list, Stone sat at number 10 out of 50. With all rentals at the time of a trade comes the potential that they feel comfortable enough to in fact re-sign and shed the rental tag over time. For general managers, in this case, Don Sweeney, there is a lot to ponder in these scenarios and Stone will not come cheap. Adding a player of his caliber to the top-six forward core gives the potential for him to join the likes of Brad Marchand, Patrice Bergeron, David Pastrnak, Jake DeBrusk, and David Krejci. That immediately becomes a much more terrifying top-six for opponents. At first, I wasn’t on board with the idea of Senators right-winger Ryan Dzingel as a rental option if Don Sweeney feels comfortable with such a transaction, but I have come around to it. When looking at players like Dzingel or Stone, acquiring a productive player from a divisional rival may be tricky, but it’s certainly not impossible. Dzingel is two goals away from matching his career high of 23 from last year through just 53 games and has 41 points. As a rental, capitalizing on a player who is thriving in a contract year might be a smart move. But a rental of a young player like Dzingel having a career year will be pricey. Dzingel punches in at number 34 on the latest TSN trade bait list. Back in early February, TSN insider Darren Dreger said he wouldn’t be surprised if the Bruins made a play on Dzingel. His speed and offensive instincts would fit in the Bruins’ top-six forward core. When it comes to a player with term left on their current contract, Tyler Toffoli could be a great option. While he isn’t having a great season, he is playing on one of the NHL’s worst teams. In 55 games, he has scored 11 goals and added 15 assists. Regardless, past seasons should qualify him as a viable target. He has reached the 30-goal plateau once before and scored 24 last season, and is a pretty well-rounded player outside of his goal-scoring ability. Toffoli is set to make $4.6 million per year for this season and next before becoming an unrestricted free agent in the summer of 2020. He is not on the latest TSN trade bait list, but his name has been thrown around and it could be a route that the LA Kings explore options to improve in the future. Toffoli could fetch a solid package of assets in a trade. If Gustav Nyquist is willing to waive his NTC, he is a tantalizing trade option. The 29-year-old winger is currently making $4.75 million before hitting unrestricted free agency this summer. His 14 goals and 47 points in 55 games make him a threat for at least 60 points this season. The 33 assists that he has amassed are best on the Red Wings. Nyquist sits seventh on the latest TSN trade bait list. He’s a pure scoring threat on the wing. The Bruins made three trades with the Rangers in 2018. Who says they couldn’t make their first of 2019 by the trade deadline? Mats Zuccarello would be a great piece. With nine goals and 22 assists, good for 31 points in 41 games, Zuccarello is having himself quite the contract year, like Nyquist. The 31-year-old Norwegian winger is currently making $4.5 million ahead of a possible increase in pay this summer. For the remainder of the season, Zuccarello’s speed and elusiveness, along with a polished skill set would be a great boost to the Bruins’ offense. Don Sweeney has a lot of options to ponder over the coming weeks as the opportunity to load up before a potential playoff run lies ahead. Roll with what you have, or be bold and make a splash, the direction of this Bruins team lies in Sweeney’s hands, in part.